Luigi Di Maio, Italy's deputy prime minister, blamed France for causing people in Africa to migrate to Europe. Italy's new government has frequently clashed with France on migration and foreign policy. France's foreign ministry on Monday summoned Italy's ambassador after what it called "unacceptable and groundless" comments by Italian Deputy Prime Minister Luigi Di Maio in which he attacked Paris' policies in Africa, according to multiple reports. News agencies Reuters and Agence France Presse said that European Affairs Minister Nathalie Loiseau summoned Teresa Castaldo, Italy's ambassador to France, on Monday afternoon regarding incendiary remarks by Di Maio on Saturday. Speaking in the Abruzzo region in central Italy, Di Maio, the leader of Italy's anti-establishment Five Star Movement, accused France of creating poverty in Africa and fueling mass migration to Europe. 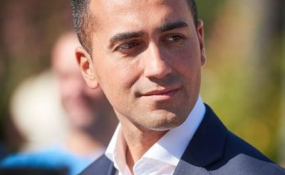 "If we have people who are leaving Africa now, it's because some European countries, France in particular, have never stopped colonizing Africa," said Di Maio. "If France didn't have its African colonies, because that's what they should be called, it would be the 15th largest world economy. Instead it's among the first, exactly because of what it is doing in Africa." Italy's new government, composed of Di Maio's Five Star Movement and Italy's anti-immigrant League party, has clashed with France over several issues ranging from immigration to African policy. It is a dramatic diplomatic shift after Italy's previous center-left administration maintained close ties with French authorities. Last year, French President Emmanuel Macron criticized Italy for closing its ports to charity-operated migrant rescue boats. The French government has since largely avoided getting into a war of words with Italy. In response to the summoning, Di Maio late Monday dismissed the idea of a "diplomatic incident" between France and Italy. He also double downed on his critique of French policies in Africa, suggesting that Paris was manipulating the economies of 14 African nations that use the CFA franc -- a colonial-era currency which is backed by the French Treasury. "If Europe wants to be brave, it must have the courage to confront the issue of decolonization in Africa." France has argued that the CFA franc has brought monetary stability to countries that use it, but French President Emmanuel Macron said in 2017 that African governments need to decide what to do with the currency.